This weekend we celebrate Imbolc, one of the four major Sabbats in the pagan Wheel of the Year. At the winter solstice we welcomed the return of the Sun, but the peek of winter doesn’t arrive until Imbolc. Even though the days are slowly getting longer, the temperatures are at their lowest and the weather is bitter. Imbolc is a Gaelic celebration of the goddess Brigit, who was later integrated into Christianity as Saint Brigit. She is a fire goddess, associated with creativity, inspiration, and healing. In the depth of winter, Brigit calls on us to turn inwards, to nurture the fire in both our homes and ourselves. This is the time of year when we generally experience cabin fever - and creativity is the best antidote. By pursuing creativity, we honor Brigit and nurture ourselves. One of my teachers taught me a meditative exercise for deepening one’s connection to Brigid, which can be used as a devotional exercise or as an intention-setting ceremony. Use this exercise to help you with your creative endeavors or any project that could benefit from some fire energy. This exercise can be performed at any time of the year, not just at Imbolc. You will need 9 red candles, and commit to a 9-day stretch where you can meditate for 10-15 minutes every evening. Before you start, clearly define the intent of your novena. The intent can be to simply develop a closer relationship with Brigit, or you can ask for guidance or energetic help for a specific project or situation. Whatever you pick for your intent, this is what you’ll be nurturing for the duration of the 9 days. Write this down on a piece of paper. Every night, for nine nights, you will perform a short ceremony for Brigit. Using a fire safe dish, set up one of your candles in a place where you can leave it to burn all the way down. Place the piece of paper with your written intent under the fire safe dish. If you are able to set up an altar, you can arrange offerings in front of the candle, such as a dish of rosemary or a piece of carnelian. After stating your intent, take a few minutes to enter a meditative state and watch the flame. Allow yourself to feel your connection to Brigit and your inner fire, and hold your intent clear in your mind. When you feel ready, take a deep breath and release your intent. Allow the candle to continue burning all the way down. Repeat this every night for the duration of the 9 day period, burning one candle each night. On your last night, use the last candle to burn your piece of paper and thank Brigit for her blessings. Speaking of creative projects, my book A Little Bit of Shamanism is officially available for pre-order! Happy new year, dear friends! For those of us following the Pagan Wheel of the Year, we just celebrated the New Year at Samhain, the third harvest, which coincides with Halloween. We’ve been doing some real deep diving, having examined the Taurus-Scorpio axis at the last full moon, and reconnecting with our ancestors at Samhain. This is the time of the year when the veil between the worlds is the thinnest, so messages from our helping spirits are louder, and it’s a perfect time to do divinatory work. Samhain falls in the middle of Scorpio season, which makes sense on so many levels. Scorpio is the darkest and deepest of the signs in the zodiac. It’s a water sign, and holds our raw, unfiltered emotions and personal truths. It’s gritty and honest. Scorpio is the seat of desire in all forms, that entices us to enjoy our humanity, and to do so without shame. When I speak to folks about Scorpio, what usually comes to their mind first is the negative side of Scorpio: jealousy, vindictiveness, manipulation. These are undeniable traits of the scorpion, but this is the shadow side. Scorpio is the most transformative of the signs. It is a gateway to profound healing and transformation for those who learn how to work with its energies. As you continue to move through Scorpio season, ask yourself if you’re ready to transform, and take the time to figure out what that will look like for you. I’ve included a brief exercise here, which might help you pave the way. You will need: a candle (and something to light it), a small piece of paper and a pen, a small fire safe container or dish. Before you start, take the time to set up your sacred space, in whatever manner resonates for you. You may want to burn sage to clear the energies, sing, use rattles, or do anything that helps signal to you and your helping spirits that you are disengaging from the mundane and preparing for ceremony. I call out to my helping spirits, my power animals and my ancestral guides, to aid and support me in this work. This is a first step in allowing change into your life, and we do so with the understanding that we are at the center of our own existence. Think of one (just one, remember change happens one step at a time) pattern or thought of behavior that you engage in that does not serve your highest and best. Write it down on your piece of paper and set it aside. Now pick up your candle, which you will be charging with specific intent. Set up your candle in a candle holder or stick it to a safe surface by melting the bottom. Once it’s secure, use your thumb and index finger on your right hand to stroke the candle from tip to base. As you do this, hold clear in your mind’s eye the intent to draw down the capacity and motivation to bring this change into your life. Continue doing this until you feel your candle is fully charged with this intent, and then light the candle. Using the flame of your candle, burn the piece of paper where you wrote down what you intend to release. Let the paper burn completely, and dispose of the ashes. You can let them blow away in the wind, or even flush them down the toilet. Let the candle burn down all the way. You don’t have to watch the candle as it burns completely, but as you close out your ceremony, thank your helping spirits, power animals and ancestral guides, for witnessing your ritual and ask them to support and aid you as you move through this transformation. So we’ve blown through Virgo season and have entered Libra season after a powerful combination of equinox and and full moon energies. On September 22nd, we had the autumnal equinox, one of two days in the year where night and day are completely balanced. Then on September 24th, we had a full moon in Aries, which as part of the Libra-Aries axis, calls us to evaluate our sense of self and the way we interact with those around us. The equinox also coincides with Mabon, a Pagan celebration of Celtic origins, which is what I want to discuss today. Mabon is the second harvest, preceded by Lammas at the beginning of August. At Lammas, we celebrate the the first harvest, the harvest of the grain. Our altars are adorned with corn husks and sheaves of wheat. Mabon is the fruit harvest, which is why apple picking is such a common activity this time of year. The energies I want to discuss today are those surrounding the concept of harvest. I’ve noticed that every year, it seems as if my life experiences significant upheaval in September. As I’ve checked in with those around me, it seems as if most of you are also experiencing this. This upheaval happens on a communal level, not just a personal one, which tells us that there are large energetic currents at play. Mabon is the time of year when we gather the fruits of our harvests, both physical and metaphorical. We tend to plant seeds in the spring, with the start of new projects, partnerships, and relationships. Once the summer comes and goes, these projects are reaching significant milestones in their cycles. When we speak of harvest and gathering the fruits of our labor, we tend to think of everything we’ve accomplished. So at first glance, it can seem contradictory to experience upheaval in the midst of a time of harvest. But when we start to look closer at the process of planting and tending crops, it starts to make sense. Not every seed will sprout, not every seedling will grow into a healthy plant, and not every plant will bear fruit. And sometimes, even when the plant bears fruit, the fruit can come out rotten or diseased. Not every harvest is successful, and there are lessons to be learned when that is the case. We experience upheaval at this time of year because our seeds are coming to fruition, and unfortunately, some of the fruits are less than optimal. We see projects fall apart, relationships fizzle out, and partnerships crumble. As we evaluate where we are right now, we have to look at everything we’ve invested in and recognize the investments that are paying off versus the ones that aren’t. With that in mind, I leave you with some of the questions I posed to our moon meditation group last night. I encourage you to take the time to copy these down and spend a few minutes writing down your answers, you might be surprised at the insights you gain. What seeds did I plant this year that were successful? What seeds did I plant this year that didn’t yield anything? What seeds did I plant this year that had negative yields? Happy Virgo season, friends! I took an unplanned August break from writing here to wrap up a big personal deadline. I can't share details on here quite yet, but keep an eye out for a fun announcement soon! I love Virgo season. Growing up in the Southern Hemisphere, we would be easing into spring and looking forward to the summery holiday season. Now in the Northern Hemisphere, it ushers in the beautiful colors of the fall and carries us into Samhain. I feel like Virgo energy is one of the more misunderstood astrological correspondences. Virgo is an earth sign, and deeply rooted. Virgo performs well in the material, tangential realm, and is known for organization and management, sometimes to the point of obsession (I say this as a Virgo, and fully recognize my own neuroses). But I don't see much discussion of the more profound aspects of Virgo, which really make Virgo season a time when we can really dive deep into ourselves. 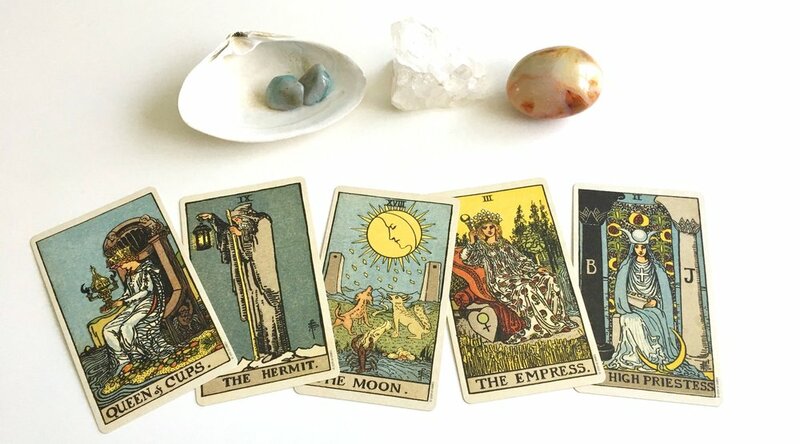 In tarot, Virgo is linked to the Hermit card, which starts giving us some hints as to the deeper meanings of this sign. The Hermit tells us the story of someone who willingly separates themselves from society to search for wisdom. They are not secluding themselves with the goal of seclusion unto itself, but rather for the pursuit of growth. This can be compared to indigenous practices of vision quests, where someone leaves the comforts of home and community to journey into nature and experience a powerful shift. This is what the true energy of Virgo is about. Beyond the stereotypes of rigidity and obsessive-compulsive tendencies, Virgo is about integration, which is working towards a more holistic union of mind, body, and soul. Virgo pushes us to connect our higher and lower selves, and understand that the sacred in all of us is not separate from the incarnate part of ourselves. So I leave you with that to ponder, and a Virgo-inspired tarot spread to kick off September. How does my body need to be nurtured right now? How does my soul need to be nurtured right now? How can I better integrate these two aspects of myself? Hello friends, here we are a couple of days late from my usual Monday. I spent last weekend in the woods, away from cell phone reception, and participating in ceremony with beautiful souls who are very dear to me. It always takes me a little while to shift gears from ceremony back to the "real world." Today I want to discuss the Magician-Strength-Devil triad in the tarot. This axis assumes a Rider-Waite based Major Arcana, with Strength as the 8th card. In some decks, we do see Justice as 8, but in all honesty that wouldn't change the analysis of this triad dramatically. What do I mean by triad? When we look at the Major Arcana, specifically at the narrative of the Fool's/Hero's Journey, we often split the cards into sets of three. The Fool stands apart as the protagonist, and the remaining cards are arranged numerically into three levels: cards 1-7, 8-14, and 15-21. Each of these levels has a narrative, but my focus today is on the vertical triads that emerge from this layout. More specifically, the Magician-Strength-Devil triad. When we arrange the cards as described here, we end up with triad subsets: 1-8-15, 2-9-16, 3-10-17, and so forth. The first triad, 1-8-15, shows a relationship between the Magician, Strength, and the Devil. The Magician is the initial spark of consciousness and ego the Fool experiences. He learns to want and to manifest, thinking outside of himself and projecting his will. Strength is the first card of the second level of the Major Arcana. The Fool has concluced his journey in the physical world, departing in the Chariot to explore the next level. In Strength, he acknowledges his animal instinct and learns to tame it. But there is a piece missing in this process that doesn't come full circle until we reach the Devil. Acknowledgement is not the same as true confrontation and acceptance. It is one thing to acknowledge the untamed part of ourselves - it is quite another to give into it, dance with it, and come out on the other side. Only by immersing ourselves and truly stripping away our egos can we dispell fear and find growth. Light always casts a shadow, and the brighter the light, the darker the shadow. The Devil asks us to go beyond simply acknowledging our shadow selves and actually spend time with our shadows. Beyond that, if we look at the cards immediately following this first triad, we get the High Priestess, Hermit, and the Tower. This tells us that after dealing with the very projective and instinctual energies of the first triad, the next step is a turn inwards, seen in the High Priestess and the Hermit. In the tower, we are asked to surrender to a complete foundational shift. Once we have surrendered to the medicine of the Devil, we are ready to tear down our existing structures and build new, stronger foundations for ourselves. The Devil is the conclusion of the Magician, because we cannot truly come into our power without a full exploration of ourselves. This weekend, I found myself some new crystal companions. Having grown up in Brazil, I've always felt an affinity for the quartz family. Quartzes have always felt like home, in that they often are literally pieces of my homeland. Lately, though, I've been feeling drawn to agates, and just got my first pieces of Dendritic or Tree Agate, also known as Merlinite. Dendritic Agate is a stone of ritual, shamanism, and magic. It can help part the veils between the worlds. What area of my life is ready for expansion? What is my first step in allowing or welcoming in this expansion? On April 18th, Chiron moved into Aries, after having entered Pisces in 2011. Chiron in our astrological charts represents our deepest, primal wounds, and our work to fix them. When Chiron was in Pisces, this work was mainly internal. In Aries we move into projective, external energy where we are being called to heal our sense of Self. We are entering a phase of expansion through projection. 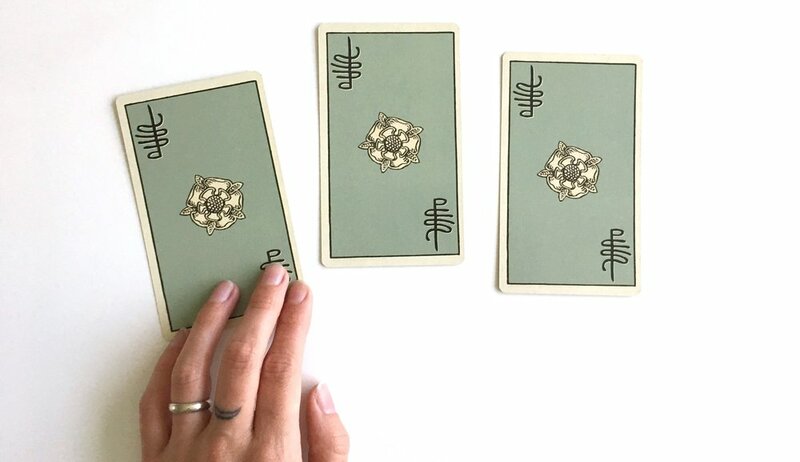 With this in mind, we can use this simple tarot spread to gain insight on where the energies in our life are shifting with Chiron's sign change. We are finally coming out of Mercury Retrograde, after what has felt like a very long three weeks (culminating with a broken fridge in our home, but I digress). We generally move from contraction to expansion with the coming of Ostara, the spring equinox, but Mercury Retrograde both prolonged and intensified our period of contraction this spring. This came with the challenges of being confronted with turning inwards, but also the benefit of longer incubation. Now, as we move into expansion and projection, we can do so from a place of more preparation and intensity. The medicine of Mercury Retrograde was Temperance. I pulled a card for coming into expansion, with the question "What medicine should we embrace as we move towards manifesting the projects we have been incubating?" It's a bit unusual to see the 5 of Wands as medicine, as it's usually portrayed as a card of warning. But we need to remember that there is medicine for us in each and every card, and see beyond the surface interpretation. So what is the medicine of 5 of Wands? 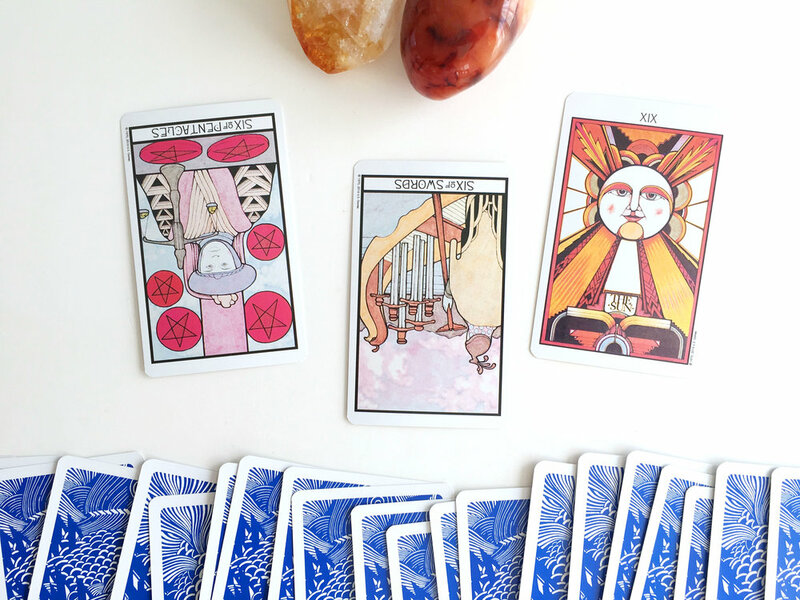 Pictured are three decks: Smith Waite, Motherpeace, and Circo Tarot. We can see that across the board, this card is about group dynamics and group energy. Generally this is seen as a struggle within group dynamics, with posturing and competition. But with this comes advice: stand firm for what is important to you, but acknowledge other perspectives and reap the benefits of having your viewpoint challenged. These moments are opportunities to make sure our perspectives are thought through carefully, rather than resting on the comfort of long-held assumptions. Fires are meant to be stoked. With the intense incubation of Mercury Retrograde, we have been immersed in shadow work. Now is the time to bring this medicine out into the more public realm, and test our growth beyond the confines of the private realm. We should also remember the medicine of Temperance, and bring that into this next step. We can always build on the medicine of the previous season. The balance and ability to bring harmony to multiple elements will give us tools for working through the 5 of Wands. We are in the midst of Mercury Retrograde, which combined with the Aries sun, has turned out to be a moment of significant intensity. We entered Mercury Retrograde on March 23, and will remain here until April 15. We will be immersed in these energies for three full weeks. In the discussions I've been having with those around me, the theme of this transit is pretty clear: withdrawal and balance. When I pulled a medicine card for this week, I was not surprised to see Temperance. Temperance is both balance and alchemy. She has one foot on the ground and one foot on water, urging us to integrate the conscious and subconscious. She uses golden chalices to mix her potion, balancing the ingredients carefully. She reminds us of the importance of bringing the right amount of each element into the mix. Medicine is not a single thing, but the alchemical combination of many. The Magician card is ruled by Mercury, and Mercury Retrograde is inevitably linked to the Magician's Trickster energy. The usual outward-manifesting energy of the Magician gets turned around, forcing us to pause. To find the medicine in this, we can consider the Magician within the greater context of the Major Arcana. The Magician is the great manifester, but he does not stand alone. His mirror is the High Priestess. Where he is the creation of will, she is the creation of soul. Mercury Retrograde urges us to consider the medicine of the High Priestess, and turn inwards. This is the time to recognize and honor our knowledge, to remember that the true answers come from within. The ultimate medicine of Mercury Retrograde in Aries is in pausing, and connecting with our inner realm. In the last journal entry, right before Mercury Retrograde started, I spoke of March as a time of contraction. In this Mercury Retrograde period, that contraction is intensified, to the point of unavoidance. This is the time for Temperance, the time to integrate our outward projections with our inner knowledge, as we prepare to set manifestation into motion once Mercury goes direct again.